AO Alkaline Antioxidant Water System SOD-2000 ★ Alkaline Water System Johor, Kluang, Malaysia supply ★ Azure Purewater Marketing Sdn.Bhd. What is Alkaline Ionized Microwater? OH- One atom of Oxygen and one atom of hydrogen negatively charged, the Hydroxyl ion. This is the prized Alkaline water that we drink and love. H+ One atom of Hydrogen. This is the acid water we use externally and for germicidal cleaning. This splitting of the H2O Molecules happens in a sealed ionization chamber within your filter for ionized water, under exact control of a dedicated microcomputer, to ensure the exact result time after time. As filtered tap water passes across 5 specially designed Titanium-Platinum electrodes, it separates into the two components above. The pH scale ranges from 0 on the acidic side to 14 on the alkaline, and a solution is neutral if its pH is 7. At pH 7, water contains equal concentrations of H+ and OH- ions. Substances with a pH less than 7 are acidic because they contain a higher concentration of H+ ions. Higher concentration of OH- than H+. The pH scale is a logarithmic scale, so a change of one pH unit implies a tenfold shift in the concentration of hydrogen ions . pH 6 means you are ten times more acid than pH 7. pH 5 means you are a hundred times more acid than pH 7! Living things, including humans, are extremely sensitive to pH and function best (with certain exceptions, such as different portions of the digestive tract) when solutions are nearly neutral. Most interior living matter (excluding the cell nucleus) has a pH of about 6.8. Blood plasma and other fluids that surround the cells in the body have a pH of 7.2 to 7.45. A blood pH of 6.9 can induce coma and death. That is why all bodily systems are secondary in importance to the system of pH balancing. Your body will willingly shut down digestion, alter temperature, rob your bones of calcium, deprive your pancreas, just to maintain adequate fluid buffers of alkalinity to balance the 'acid tide' we inflict upon ourselves through diet and stress. However your body possesses numerous special mechanisms to aid in stabilizing these fluids so that cells will not be subject to appreciable fluctuations in pH. Substances which serve as mechanisms to stabilize pH are called buffers. Buffers have the capacity to bond ions and remove them from solution whenever their concentration begins to rise. Conversely, buffers can release ions whenever their concentration begins to fall, thus helping to minimize the fluctuations in pH. This is an important function because many biochemical reactions normally occurring in living organisms either release or use up ions. Imagine now what a load is taken off your body if its primary safety system of pH balancing can be 'stood down' from a continual 'full alert' because you now have a plentiful supply of alkaline water! When tap water arrives at our homes, it will usually have neutral pH ranging around 7.0. It will, however, be robbed of its electrical negative charge and always have a positive ORP (Oxidation Reduction Potential). This means it has no antioxidant abilities and cannot assist your body in the fight against oxygen free radicals. On the contrary, it actually robs you of energy as you drink it. The measurement of this positive or negative charge is expressed in millivolts (mV), so an ORP reading on our ORP meter of tap water will most likely show around +350 mV. After it has been through AO Microwater filter it will most likely show anything from -150 to -650mv (depending on the amount of soluble minerals in the water and the level of electrolysis on the filter). 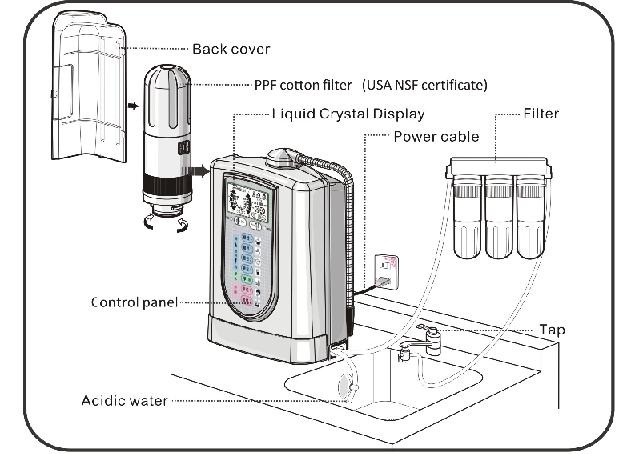 The amazing power of AO Microwater filter is the result of the marriage of technology and age-old water principles in the form of computerized individual pH and ORP capabilities. The precision of this onboard computerized measurement cannot be duplicated in systems without electricity. The first thing AO Microwater Filter does to your input tap water is removing the the mud and rust using 0.9 micron high performance ceramic carbon filter. Then the mud and rust free tap water is filtered using a combination of bacteriological and particulate control, incorporating silver activated charcoal, the most accepted and proven method on the market. It DOESN'T filter out is soluble minerals. It is not like distillers or reverse osmosis devices which remove all the minerals in the water. Stage Three: Ionizing Your water now enters the ionization/electrolysis chamber. Here it has a very specific low voltage electric current passed through it, which causes the soluble minerals in it to be attracted to either a positive 'pole' or a negative 'pole' depending on their own electrical charge. When this happens, the water separates into alkaline and acid streams. We drink the alkaline water and we use the acid water externally, for skin, healing, plants and disinfecting. 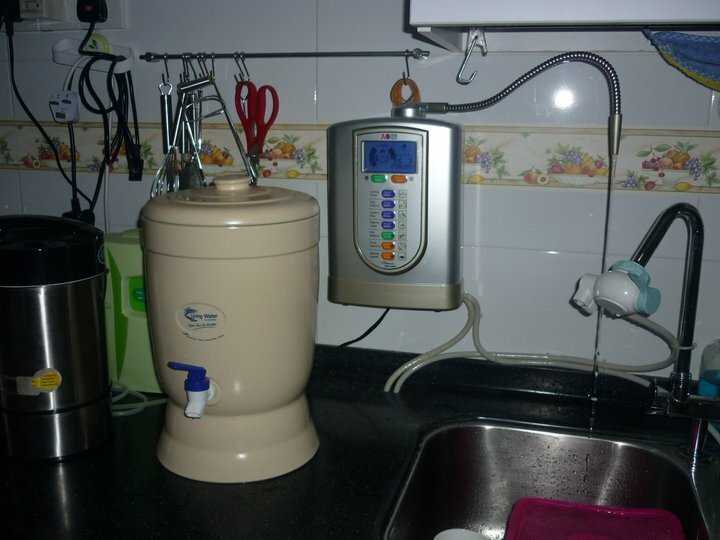 This function is under the control of the AO Microwater Filter, a solid state onboard computer that determines the exact voltage for each user, chosen by a simple press of a button. At the same time, the alkaline water undergoes a profound change. From ordinary H20 it becomes OH- . This means it becomes a powerful antioxidant formula at an atomic level. It also means that it changes the way its molecules group together. Instead of large groups of 12 molecules, it gathers in much smaller (about 5 or 6 molecules) groups. This change of molecular form also means, according to Dr. Hayashi, of the Japanese Water Institute, that it gains the ability to penetrate tissue and cell walls far more easily. This is why many people experience detoxification effects in the first few weeks of drinking the water, as it infiltrates areas that have not been reachable with ordinary H2O.